DCI Alan Lapslie suffers from synaesthesia, a neurological condition that means he experiences everyday sounds as strong taste sensations. The clicking of his keyboard registers as hot pilchards in tomato sauce while his Sergeant’s voice registers as grapefruit and he experiences a myriad of other tastes continuously unless he can be in complete silence. Which is why is working from home at the opening of this book but his superiors want him to resign from the Force on disability and so demand he comes back to work on the high profile case of a television reporter who has been tortured and murdered. Lapslie doesn’t want to resign and so takes on the case. The portrayal of Lapslie’s condition and how it affects his work and his personal life is quite fascinating and has a genuine feel to it, though his treatment by his employers is less believable (I couldn’t help but create a mental list of all the health and safety rules that were broken in his case). Lapslie is both an intriguing character and a likable one, desperate not to be seen as disabled and fighting daily to have any semblance of a normal life he never plays ‘the pity card’ but just tries to get on with his job (when he’s not vomiting in the corner from all the overwhelming tastes in his mouth). He’s joined by other warm, interesting characters including DS Emma Bradbury who tries clever ways to help him manage his problem and the Coroner Jane Catherall who has her own physical problems to deal with but is also smart and engaging. McCrery writes female characters well. In chapters alternating with those depicting the police investigation, we learn about the killer Carl Whittley and this is where the book became less engaging for me. I suppose it is reasonable that these chapters had none of the warmth of those describing the police investigation but I didn’t find the depth either. As the animal torturer turned serial killer Carl seemed very much a stereotype and his family weren’t any more original. In the first book in this series, Still Waters, McCrery does an amazing job of portraying his culprit in a sympathetic light even though she is quite patently mad if not absolutely evil but he doesn’t quite pull that off here. He does show Carl as someone on the fringes of society who perhaps would not have trodden his path if the world were a more caring place but I never quite swallowed Carl as the kind of killer he was being shown as. His ‘plan’, outlined early on, had some glaring logical holes in it that kept making me think things along the lines of “if you really were trying to do what you said then you wouldn’t be choosing this victim” and I thought it was trying a bit too hard to have a gimmick, almost as if murdering people isn’t mad enough. Summing up all of that is quite difficult as I enjoyed one half of the book and was quite a bit less enthralled with the other half. I suspect this book was written with more emphasis on a possible TV adaptation than the first as it felt like it had more visual content and less concentration on any one thing (there was more going on). Though with McCrery being one of the writers of the TV shows Silent Witness and New Tricks perhaps he is just less successful at writing for the different mediums in this instance. Overall though the book was a fast-paced read and I never considered giving up on it as I really was intrigued to learn how Lapslie and his colleagues would work their way around to Carl. 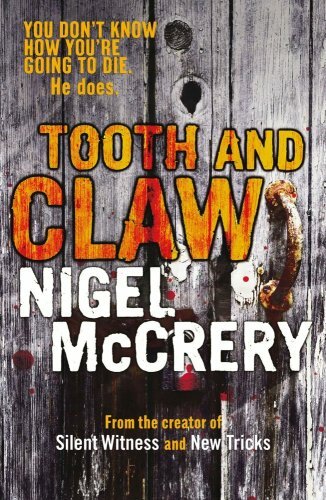 This entry was posted in book review, England, Nigel McCrery. Bookmark the permalink. Bernadette – Thanks for this review. Isn’t it interesting how one half of a book can be so different from the other. I’ve read books like that, too. As I read your post, too, I was thinking about how difficult it is to portray a serial killer in an interesting light. Some authors do it quite well. Others do not. To me, that’s one mark of a talented author – someone who can make all the characters worth reading about – including the killer. Excellent review, Bernadette. Definitely not a book for animal lovers. I have now been sent the next in the series by the publisher, so let me know if you want me to send it to you when I have read it, possibly several aeons into the future. This book sounds so interesting, especially about the disabilities of the protagonist. But I don’t like serial killer themes and I abhor harm done to animals, would have to skip all of that. Oh, gee, and I was so taken by the start of the review. Why these plot devices? Good to read your review, as always.